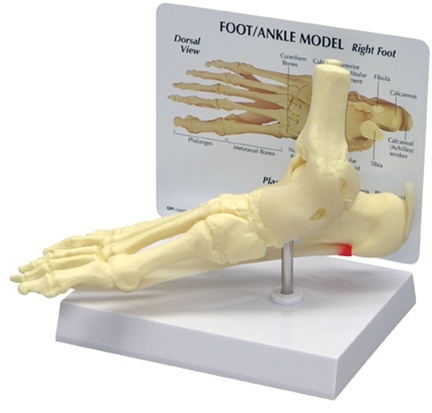 Life-size model of a right foot features the platar calcaneonavicular (spring) ligament with plantar fascitis. Also includes tibia, fibula, calcaneus, calcaneal (Achilles) tendon, deltoid ligament, lateral (collateral) ligament, plantar aponeurosis, cuneiform, phalanges, cuboid, navicular and metatarsal bones. May be removed from base. Size 9” x 2-3/4” x 4”. Includes patient education card.